Kindles, Nooks, iPads, even smartphones… it feels like everywhere I look, someone’s got some kind of e-reader. Heck, even my mom got one for Christmas last year! Being the voracious reader that I am, you’d think I would be first in line for the latest device. But this is one geek trend I’m skipping, for now. I’ll take my reading the old-fashioned way. I grew up devouring books. Most times when I got suspiciously quiet, it wasn’t because I was up to mischief, but rather because I’d gotten lost in a book. And I wouldn’t just read them once–if I liked a book (and I rarely met one I didn’t) I was happy to return to it many times. Even as an adult I get as much pleasure reading a book for the second or third time as I did the first time through. Some people watch their favorite movies over and over, spouting memorable quotes. Why should it be strange that I do this with my favorite books? So, it seems like a no-brainer. Electronic readers have all kinds of advantages over traditional books. They’re kinder to the environment than printed editions, they’re easier to carry when you want to take the whole library along, and I could read late into the night without turning on the bedside light. Anti-glare screens make it convenient to read outside, and advances in battery usage make it possible to go for weeks without needing a charge. But I’m still not sold. 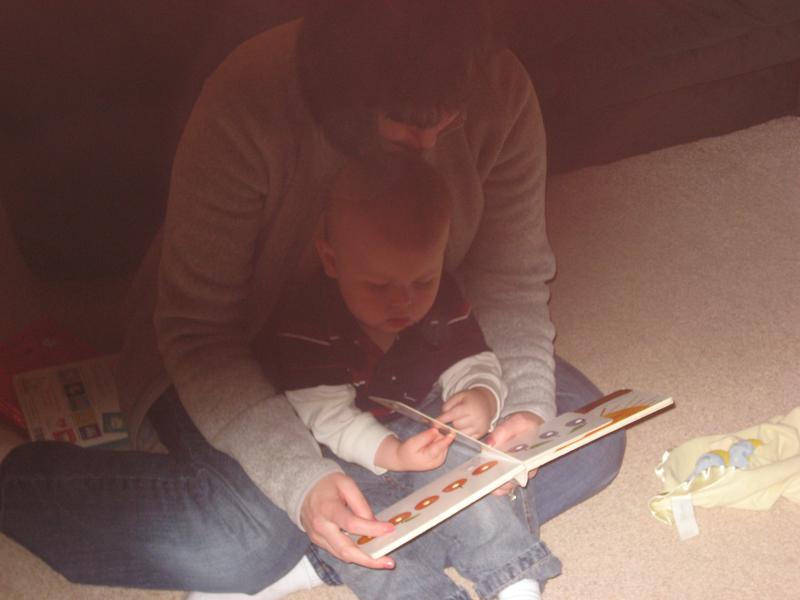 I’ve got a more important, less personal reason to pass for now: I want my son to love reading as much as I do. Kiddo is still too young to tell an iPod from a smartphone, and the only difference to him between those two and our laptops is their size. In this little boy’s eyes, all of them serve the same purpose: to prevent Mom and Dad from paying Kiddo his rightful share of attention. If I pull out my phone to take a quick peek at my email, he’ll grab my arm and say “No, mom!” He’s even reacted that way occasionally to other electronics like our digital camera. So, as handy as an e-reader might be for me, he’s not going to see it as a book. He’s going to see it as one more distraction. Children copy the behaviors modeled by their parents. I remember playing in the backyard as a child while my own mother sat nearby with a book in hand. To show Kiddo how enjoyable reading can be, we have to demonstrate it with items he recognizes as books, not gadgets. Frankly, it’s not that much of a burden for me. I like reading traditional-format paperbacks. They’re a good fit for my small hands. I like the feel and sound of fanning a new book’s pages; I love flipping to a random place in an old read and thinking, “Oh yeah, I remember this part!” and diving in. And there are other benefits to analog versions. It’s easy to purchase a new one without needing any special software installed. I don’t worry about breaking them if I drop them, and I can keep reading on the airplane during takeoff and landing, while other electronic devices have to be turned off and stowed. Sure, they both get ruined if they fall in the bathtub, but the replacement cost of a mass-market paperback is considerably lower. I have no doubt that a couple of years down the road, I’ll be ready for the latest Kindle or its kin. But for now, I’ll take my dead-tree versions, with the hope that I’m planting a seed for the future. Categories: Geekery, Parenting | Tags: books, e-readers, reading | Permalink. “…planting a seed for the future.” Nicely said. And I suppose you can vary the font size by carrying around your reading glasses. Even though I have my nook, I just bought two paper books and will continue tio do this. This is a great post, there are few things better than holding a child in your lap sharing a book. It’s a great way to sneak in a snuggle – especially now that he’s on the move so much. He knows a lot of his stories now and “reads” them to us instead of the other way around. It’s so cute! This is the best argument I’ve ever heard in favor of traditional “dead-tree” versions of books over e-readers. I’ve never thought of it that way, but you have an excellent point. I think it’s a brilliant plan, really. Thank you! 🙂 I’m sure we’ll make the transition at some point, when he’s old enough to understand the difference. Heck, by the time he goes to college I wouldn’t be surprised if e-readers were the only way most books (including textbooks) are published. I usually dismiss the feel/smell/tradition arguements out of hand, but you make a veeeeerrry compelling case for traditional books. Makes me glad that my books are available in both paper and e.